Well this is a long over due post but better late than never! On February 26th we hosted Baby Ehlers Woodsy Shower at my parents restaurant CHOP in Door County, WI. About 50 of our closest friends and family gathered together to shower Baby E with so much love and adorable baby gifts. Our family is so blessed by so many amazing people!! 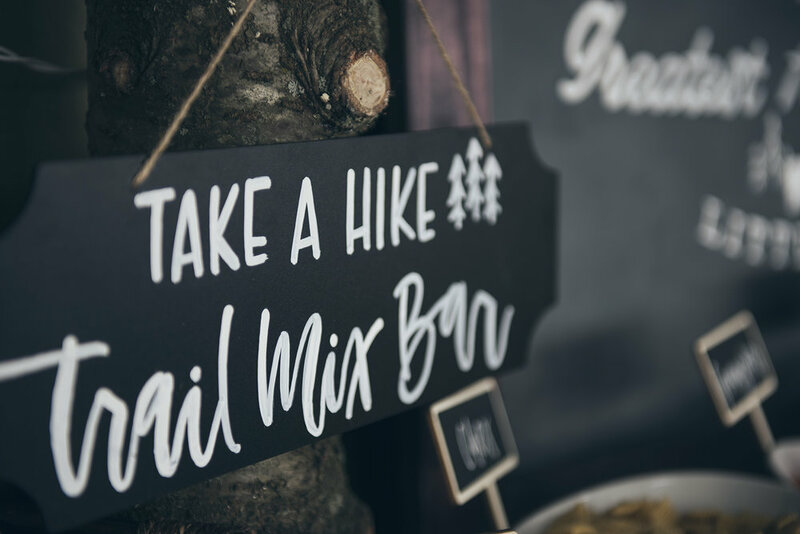 Since we planned a woodsy shower, we had to do a fun trail mix bar! We went crazy at costco and bought all the goodies for guests to build their own trail mix bags. 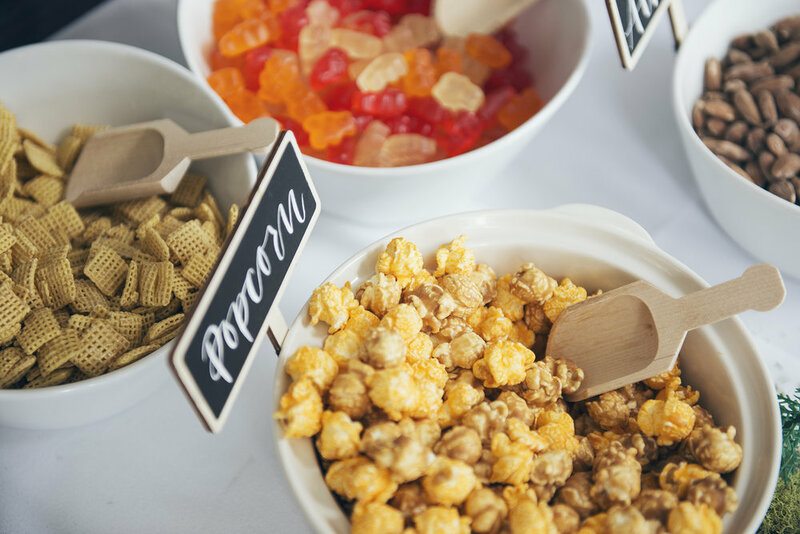 I also designed these "To Fuel Your Next Adventure" stickers so our guests could seal their bag of trail mix. While scrolling through pinterest one day, I came across this gorgeous naked Blackberry & Lavender cake by the School of Styling and thought that style/flavor cake would be absolutely perfect for the shower. For the recipe click here! Cake Toppers here, here, and here! 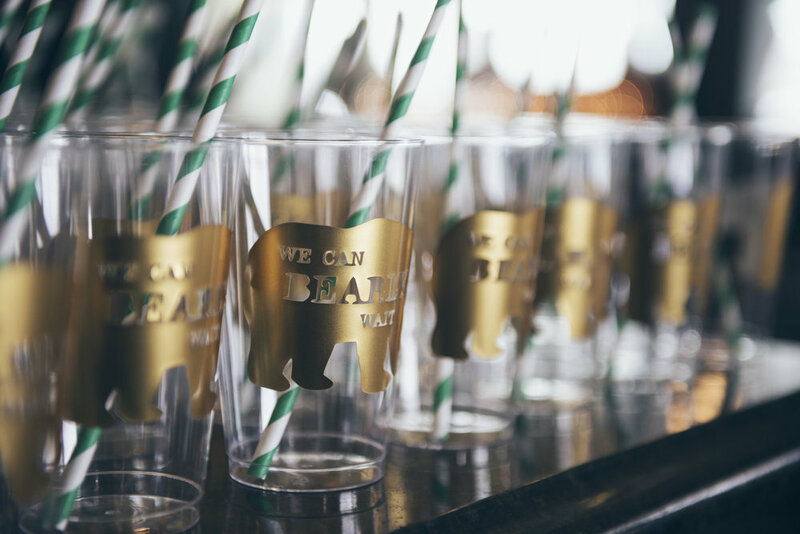 I designed these fun decals for our guests cups that said "We Can Bearly Wait" using theCameo Silhouette Machine! 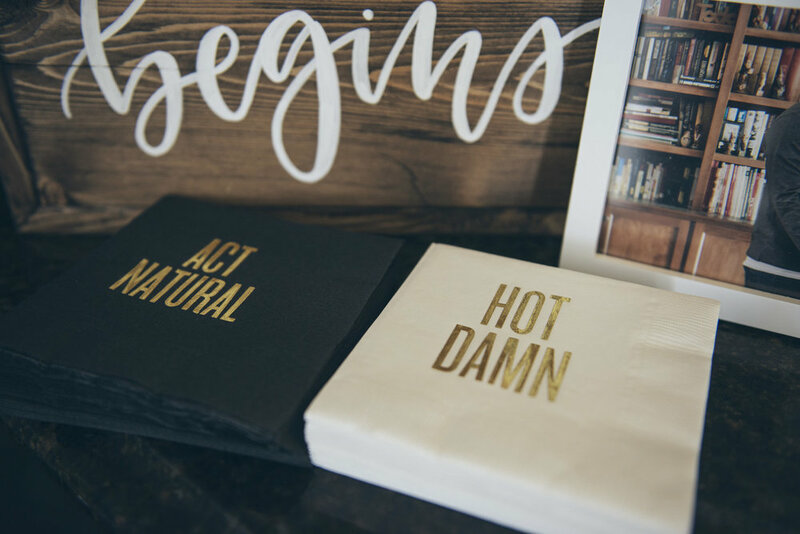 Napkins from Read Between the Lines! 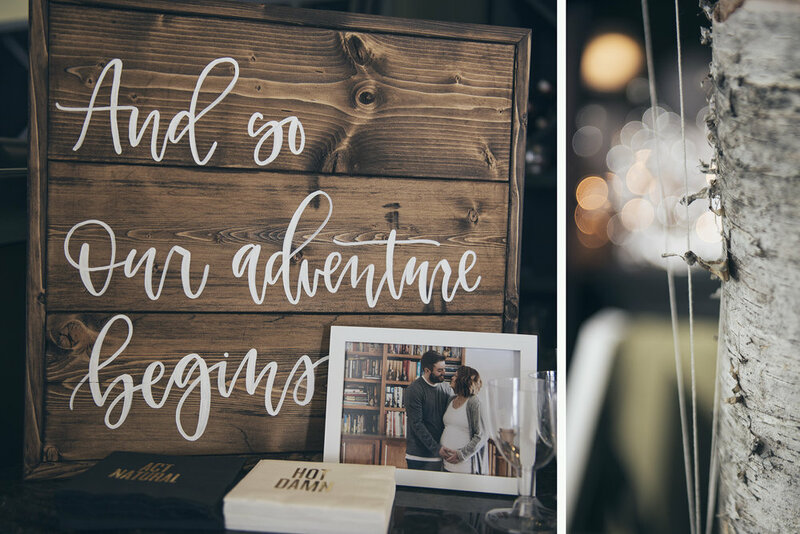 We set up a fun a polaroid station for all our guests to their pictures into Our Adventure Book! Ben and I were pretty obsessed with the movie UP when we were in high school so we really wanted to make an adventure book for Baby E when he arrived! Oh did you also know you can make custom Snapchat filters for your events?!? Seriously so cool and so easy! I designed our filter and uploaded the design to Geofilters and the filter was set to our event date and location. It was perfect and I had so much fun watching everyones Snapchat story of the shower after. We also set up a fun little Onesie Decorating Station with some fabric paint, sponges,markers, stencils, and a variety of baby onesies for our guests to decorate. Everyone had so much fun with this and Baby E now has so many onesies he can where for all different occasions. One thing I would recommend if you choose to have a onesie decorating station for your baby shower, make a note for your guests to initial the tag on the onesie. I wish we knew who made each one of our unique onesies from the shower. 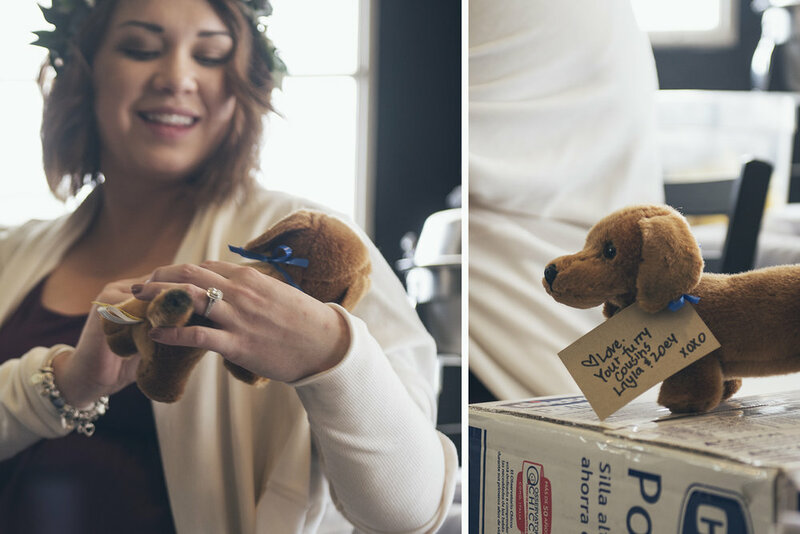 To make the process of opening gifts for our guests a little more exciting we decided to incorporate bingo. We simple had the guests fill in the bingo card squares with gifts they thought that Ben and I would receive. Then they would fill out their card as we continued open gifts. For prizes we gave away lots of wine bottles!! One of our favorite gifts from my brother and sister in law was Ben's Daddy Survival Kit! Seriously so funny and highly would recommend gifting to first time dads! You can purchase it here! Thank you Jackie from Blossoms Flower House for doing all the floral arrangements and for this gorgeous flower crown!! Thank you to all our amazing friends & family that showered Baby E with so much love and the most stylish clothes!! Also a huge thank you to my sister in law Elli for hosting this beautiful shower and helping me bring together all my crazy ideas!